Somerset Folk Harp Festival: FAQ | What is the festival like? Wanna Advertise in the festival's program? I see several workshops with similar titles and contents. Should I plan to attend only one of these? There are lots of things on the schedule. Will I be able to do everything I want? There is a very full schedule. What are some coping strategies? Is food included in the Festival admission? What do I do with my harp when it is not in use? Do I need to bring a harp to the Festival? What will there be in the Exhibit Hall? Can I sell my harp at the festival? Can I bring flyers or ads from my local luthier and leave them around for people to pick up? What is expected of me in a workshop? Are workshops assigned ahead of time, and how will I know which ones I can go to? I can get private lessons? How does that work? What will there be to help me relax (surely I am kidding!) between events? I need some work on my harp. Will there be a harp regulator there? If I bring a harp "Companion" what will there be for him/her to do? What about children? Is there anything for them to do? What is a harp tasting? Can I record the concerts or workshops? Why are there no pedal harps in the concerts or workshops? Can I get CEUs for attending the Festival? It's awesome! It is like a three-ring circus, a harp feeding frenzy, a family re-union, and your wildest harp dreams come true! You will get to meet and talk with and play with other great folks who share your addiction to the harp. You will get to swap "war stories" "craziest wedding stories" and "Why I started to play the lever harp" stories. There are lots of good harpy things going on - see next paragraph- but the one thing that really makes the Festival is all the other harpers there. Harpers are the friendliest, most supportive, non-competitive folks I know. You will have an instant group of best friends at the Festival - including the stars of the harp world. 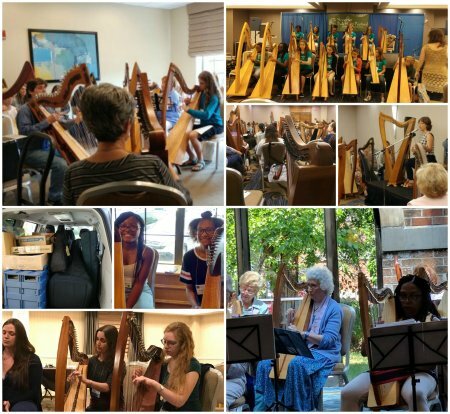 You will find that you can talk with icons like Grainne Hambly, Deborah Henson-Conant and Kim Robertson just as easily as you would talk with the other harpers in your harp circle. And if you are new to the harp world and don't yet have a support group - you will be welcomed most warmly and drawn into the family! OK- so what else? There will be an incredible selection of stuff to try out, read through, buy, dream about, plan for, and tale home. Harps, Cds, sheet music, doo-dads, jewelry, artwork, music stands, carts......etc. The Exhibit Hall is open Friday at 11am to 7:00 pm; Saturday from 11:00 am to 5:30pm andon Sunday from 11am to 3pm. The concerts are designed to give you a diverse and broad exposure to the non-pedal harp world. Celtic, yes, but lots of other ethnic music, early music, classical, jazz, popular, and many sorts of harps including Paraguayan harps, bray harps, cross-strung harps, wire strung harps, double strung harps, harps with other instruments, and more! Diversity is highly treasured in our culture, and our harp world is a paradigm of diversity. The workshops range is incredible. Some of them are really substantive and challenging - some will pique your curiosity - some will inspire you to play better and some will be an occasion to let your hair down. The worst thing about the workshops is that you cannot take them all. For the duration of the Festival you will eat, sleep, talk, work and dream harps. Do try to pace yourself! Different artists have different slants on the same topic. Improvisation will be very different when taught by two different harpers. That several workshops address the same topic is an indication of how important that topic is, and that there are many ways to approach it. If you are hoping to improve your improvisational skills, by all means attend more than one improvisation workshop. If you like ensemble playing, attend several ensemble workshops.I try to schedule workshops in a particular theme so that they don't conflict, but that doesn't always work out. Check out our Focus Area pages (from the Workshops tab, see the left side of the page), where I group the workshops according to particular themes. Unless you've figured out the cloning thing you're going to have to make choices. We've tried to schedule workshops that are in specific tracks or similar topics not to conflict with each other, so that if you want to narrow your focus on one topic you'll have an easier time creating a schedule. If you have a broader view and want to sample the variety of workshops with a variety of instructors you will undoubtedly have schedule conflicts and will have to choose. Between Friday and Sunday there are seven workshop periods and more than 100 workshops offered! So you will NOT be able to attend them all! Pick about 10 that really appeal to you, knowing that the max you can attend is about ten (if you start early on Thursday). There are also evening concerts as well as activities after the concerts are over. I know plenty of people who take an afternoon nap so they can stay up late! We've also added full-day Sunday special programs, which are optional and extra cost. Try to identify the things that are most important to you. 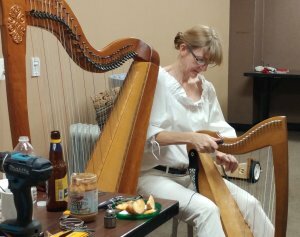 If shopping for a new harp is high on your list, be sure to attend the harp tastings. Set aside enough time to try out several different harps. You may even choose to give up a workshop session in order to take the time you need to harp shop. You will not be able to do everything on the schedule unless you short yourself on eating and sleeping! The Festival is like a three-ring circus. The schedule lists things from 8:00 am to the jams at 9:30pm to midnight or beyond! In addition, there are always unscheduled things that happen, like a jam of like-minded members in the lobby during the lunch period, an extended dinner with conversation between new friends, a gab fest with a well-known harper you've always wanted to meet. Be open to all these possibilities, and remember to enjoy yourself! Do take time to sleep, eat, socialize, and schmooze. You will note that the schedule looks like there are some significant holes - Lunch period is 11:00am - 1:30pm and dinner is 5:00 - 7:30pm. Note also that there are harp tastings at noon and there will be other events during this period. There's also a lunchtime concert if you just want to sit and eat and listen to wonderful live harp music. This is a casual event. The Festival is not a fashion show - be comfortable. Remember that all events occur in the Sheraton Hotel, and the hotel is air-conditioned. You may want to have a sweater or sweat shirt just in case. We get complaints that it's too cold and just as many complaints that it's too hot. The festival will be selling all kinds of wearable festival stuff like t-shirts, tops and jackets. Nope! The hotel is a full-service hotel, so there is a fine restaurant, food available at the bar and there's room service. There are some local eateries and fast food places within easy distance of the hotel. Use your Smartphone or Google to find them. For the noon time concert events - the harp tastings and other events, you can grab a sandwich, salad or wrap at the "grab & go" station the hotel will put up outside the festival lobby or you can go to the little snack shop and bring it in to the concert area and eat while you are listening. This is actually a time-saver and very cost effective! If you are staying at the hotel, please take your harp to your hotel room. There is plenty of time between workshops and other activities. 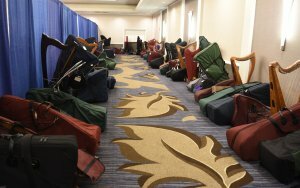 There will be "harp parking" in the Exhibit Hall in a specially marked area where you can check your harp at your own risk. All harps though must be collected by the close of the evening concert. Harps may not be left overnight. 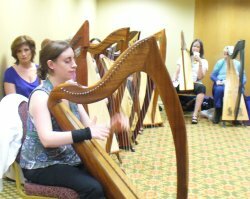 If you want to get the most of out the hands-on workshops, you might want to bring your harp. We cannot provide a harp to everybody! There workshops that do not require a harp, but in those workshops that do recommend a harp you can learn a lot by listening on full brain power, using a recording device - with the consent of the teacher - and writing things down. We have a harp loaner program for plane or train travelers. Please don't ask for a loaner just because it makes it convenient not to have to bring one. Loaners are no-cost but you must sign up in advance (it's on the registration form). Some of the staff are loaning their personal harps and a number of vendors also contribute to the pool. If you DO bring a harp you will have ample opportunity to use it. If you want us to reserve a harp, we can only guarantee a loaner harp if you sign-up by the early-bird deadline of May 1. Arrive on time. Be tuned BEFORE the workshop begins and do not noodle on the strings once the workshop has begun. Turn off your cell phone.There will be handouts - please do NOT collect an extra set or two for a friend who is in another workshop or at home. This may result in a shortage for folks who are actually in the workshop. Be considerate of others, of course. Have fun and enjoy yourself. The workshop descriptions often say "intermediate" or "advanced" - what does that mean? These descriptions are for your convenience and comfort. You will not have to take an entrance exam for a workshop. If the description says that you will learn by ear do not expect that the instructor will use sheet music (it may be handed out at the end of the workshop for you to take with though)! If you are a great and experienced musician on other instruments who has been playing harp only six weeks, don't go into an advanced class without accepting that you may be overwhelmed – but if you are interested in the topic, go anyway. It's amazing what you may remember later when you are more competent on harp! The levels that the presenters and I assign to the workshops are guidelines, not edicts. You do not have to sign-up for workshops ahead of time, except for the Thursday workshops. It may sound chaotic, but it has worked in the past. We make an educated guess as to how many people may attend a workshop and assigned the largest rooms to the workshops that we think will attract the largest attendance. You might start the Festival with a certain list of workshops you want to attend, and find that your preferences change as you go along. You might run into somebody who raves about an instructor and want to take the next workshop with that person. This way you are free to explore! You indicate on your registration form the name of the presenter you want to study with. I give your email to the presenter and then let you both work out a mutually agreeable time and place for the lesson. Lessons can take place in hotel sleeping rooms, or the Festival meeting rooms that are unused at – for example - the lunch hour. We try to stay flexible, but nevertheless it is a good idea to book lessons in advance. The cost is $75/per hour. Nope. You can let me know that you want to share a room but I can't make any guarantees. If somebody else tells me they're looking for a roommate, I'll try to connect you up. The hotel has indoor and outdoor swimming pools and a lovely lounge where you can get a drink and relax. So the Festival looks out for body as well as mind? You guys have thought of everything! We try. Remember that there are a wide variety of forums and lectures on very interesting topics. We will also have some "listening rooms" in the late afternoon where you can sit and relax and listen to a presenter performing their music in an "unplugged" setting. Yes.Liza Jensen will be regulating harps. We have information on Liza and harp regulation on the Exhibitor page. You should try to email her in advance to schedule your harp. You pay for that service on your own. In addition to relaxing at the lovely hotel facilities - including swimming pool, registered companions have admission to the Exhibit Hall, all the concerts and SOME workshops. Those workshops will be listed on the website -- and will be ones of general interest. See the Lectures page. We've had a lot of compliments on our Open to Companions program since 2009 and most companions stay in and attend workshops. If they don't want to attend workshops, you can just purchase extra concert tickets. However, companions who are not paying for festival workshops can go into New York City, which is pretty close by as well and you can take a variety of public transportation into the city. Parsippany is in Morris County with many historic attractions and gardens (see the tourism board's website) and it's also not that far from the Jersey Shore. If you're talking about children who don't play the harp, your non-harp "companion" can take the kids to New York for the day or the Jersey Shore. There are also lots of other local attractions around Morris County (I can heartily recommend the historic sites in Morristown) as well as a pool at the hotel. So while there may not be much for the non-harpig kids to do at the Festival itself, there is lots to keep them busy in the area! However, if you're asking about whether children can participate in the festival as harp players--yes, they can. In 2013, we began a Youth Harp Program. Please check it out and see if it's something your child might want to participate in. Young people aren't confined to our Youth Harp Program, however, they may participate in our workshops like any other attendee. Workshop levels are suggested and it is up to the player to choose topics that suit their interest and skill level. I love children, and most of my students are 18 and under. However, that said, any young player who's attending a workshop (and any adult for that matter) must be motivated and able to attend to the class without causing an undue distraction for others. Some of our very youngest attendees have been an inspiration and a delight! Please DO feel free to call me, Kathy, at 856-795-7637 if you would like to talk about whether the festival workshops would suit your child. If their harp teacher tells you it would be a great experience for them and they'd be able to handle it, who am I to argue with that? A blind testing that allows you to hear and compare the sounds of several harps without knowing their brand! There will be tasting for small harps - 29 strings and fewer, and over 29 strings. Depending on interest, there may also be a testing of other harps. It has come to my attention that various claims are being made about such and such a harp "winning" the Harp Tasting at the Somerset Festival. Please be aware that the harp tasting is an opportunity for the listener to make a purely subjective judgement on the merits of the sounds of harps in the tasting. Often when appraising a harp, other factors, such as its physical beauty, brand name recognition, string action and feel, and price may affect judgement, hence the harp tasting is a blind test that allows the listener to make a subjective judgement by sound only. Each listener is given a sheet on which to record his/her own impressions during the tasting. Each harp is assigned a number. The harps are played by a professional harper who plays the same selection on each. The harps and harper are hidden behind a light curtain. At the end of the tasting the identity of each harp number is revealed. Results are never tallied, no votes counted, and no awards given. Harps are as varied and individual as the harpers who play them. To claim that any one harp is the "best" or the "winner" is to claim that one size fits all, and we know that isn't true! Harps, for starters! At each previous Festival there have been over 200 harps for sale at the beginning of the Festival. No one store can offer you that selection! Sheet music, music stands, jewelry, strings, and lots more. Most retailers will take charge cards. See our Exhibitors page for who will be there. In addition the festival has its own "booth" where we sell performers' music and CDs as well as our own merchandise. No. Think about it. The exhibitors who are there to sell harps pay for the privilege of doing so, and frown on anyone undercutting them. So, my recommendation to you would be to contact your harpmaker and see if he would be willing to sell your harp on consignment. Also, any private arrangements could be done outside the purview of the Festival. If you're particularly ambitious, you can purchase table space (see the Exhibitor page) or take out an ad in the program guide. No - see the question above! The exhibitors deserve sole consideration for having paid for exhibit space and schlepped their merchandise to the Festival. If you have info about a non-profit harp-related event or organization, you may request permission from the Festival Director to display that material on a special table in the registration area. You could support the festival by taking out an ad in our program guide if you want to sell stuff or advertise your event. Because of copyright issues you may not record the concerts in any way. If we find anyone recording a concert, they will be asked to leave the festival. We don't want unsanctioned and unauthorized material ending up on YouTube and other places either. I'm sure you understand. Please DO purchase CDs of your favorite harpers at the performer's booth. Workshops which the presenters have OKd for recording are marked that way in the workshop description. Most "play by ear" workshops may be recorded. Any doubts, ask the presenter. 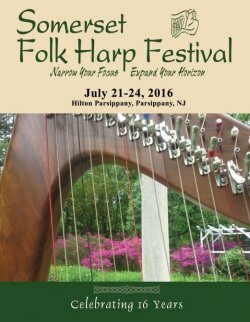 This is a folk harp festival, which by definition this is a non-pedal harp event. To use a common cliche, I like pedal harps, lots of my friends play pedal harps, but there are no pedal harps featured at the Somerset Folk Harp Festival! You will find pedal harps however in some of the vendor booths. If you are a graduate of a therapeutic harp program, such as MHTP, IHTP or Bedside Harp, check with your program director. On the list of workshops on this website, you will see that some workshops have CEUs credit associated with them. These workshops will be granted CEU credit by MHTP, for other programs, check with your program director. The nearest major airport is Newark International. The hotel does not have shuttle service to the hotel, however, we have contacted State Shuttle which operates out of Newark (and JFK) and they have vans suitable for transporting you and your harp. They only need 24-hr notice on a reservation. Cost: $60 for a trip to the Sheraton Parsippany. Call 1-800-427-3207 (if calling from outside the US, dial 973-347-3144). They also have a shuttle that runs from JFK to Newark for $30 and then go to Parsippany for the additional leg at $40. Yes and it's all free and plentiful.